No, a new album by Indian electronica rock duo Fuzzculture, is an experimental experience that probably deserves your time. Dark, weird and a lot of fun, the album is only 31 minutes but I think it works well short and sweet. The first song, “Animals” is one of the big stand-outs for me. It’s pulsing and glitchy with a pounding constant beat which carries the groove. The vocals are hard to hear because they are in the back of the mix, which I will admit is a bit of a turn-off for me, but that doesn’t ruin the song in any way. The breakdown that acts as the bridge really works, taking the groove they lay down in the first half of the song and completely reworking it to give the song new momentum. “With Open Eyes” is another one of my favourites. It’s a noise fest which manages to also be a tight groove driven song. It starts with some nice faint strumming that set up the beats and is more melodic than the rest of the album. The instrumentation really holds the song together. The vocal melody is also very catchy and memorable. There are some issues that might turn some people away from the album. First it often indulges in using percussion over melody. 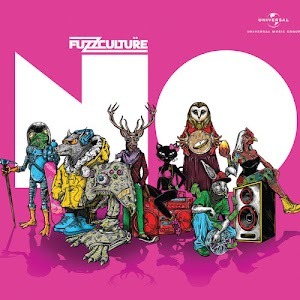 This is a style I’ve never really been fond of but Fuzzculture vary the beats to make the record stand out. The vocal production is a shortcoming. The vocals are reminicent of the clean singing on a Linkin Park record but they are so far back in the mix that they lose some of their power. But overall, I do like this album a lot, especially when it gets noisier. At times the instrumentals feel like they would be at home on a Death Grips or clipping. record. If you think this electronic rock style might appeal to you, I would definitely pick up this album. If you want to try the album check out “Promising Tomorrows”, “Feeble Minds (Blank Faces)”, and “Astronomy.” For me those are the easiest songs to digest. The album is energetic, eccentric and twisted and I really enjoyed listening to it. This album is available at iTunes and Spotify.